Remember when we all used to speak on our telephones and doodle on a pad of paper? We were tethered to the wall by the curly phone cord. Some of my best spontaneous designs were created this way. Mobile phones have changed all that, however I have discovered that ‘doodling’ lives on! 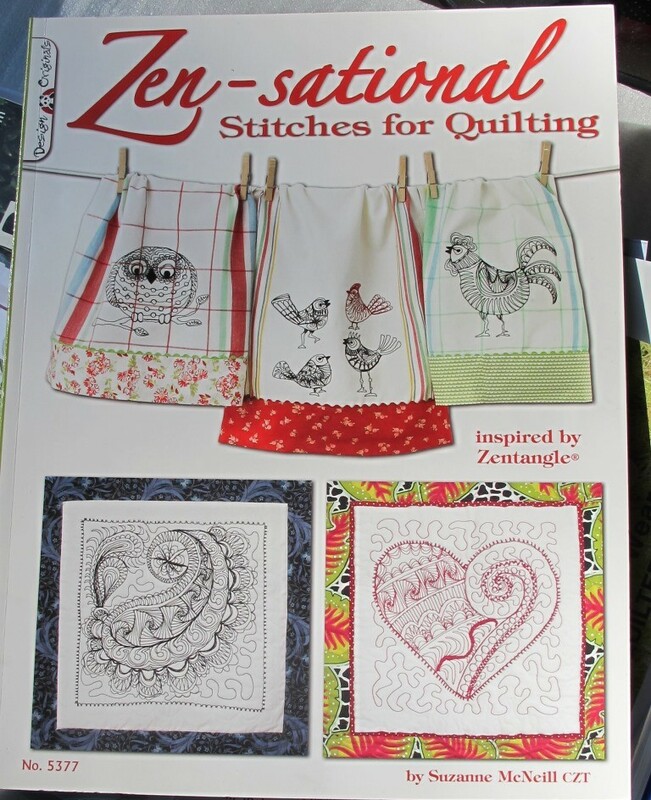 My latest book purchase is by Suzanne McNeill CZT (Certified Zentangle Teacher). 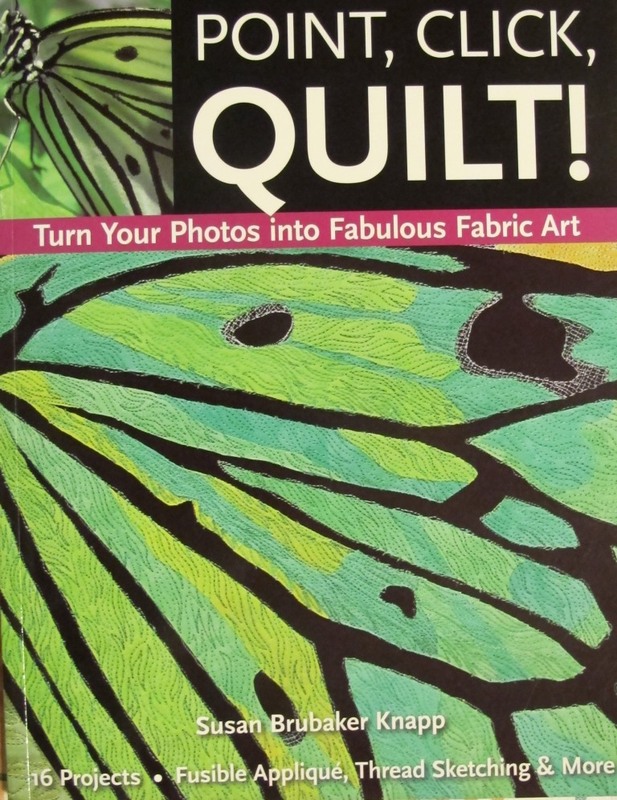 Using Suzanne’s book as inspiration, I wanted to experiment with her technique AND practice my free motion quilting. 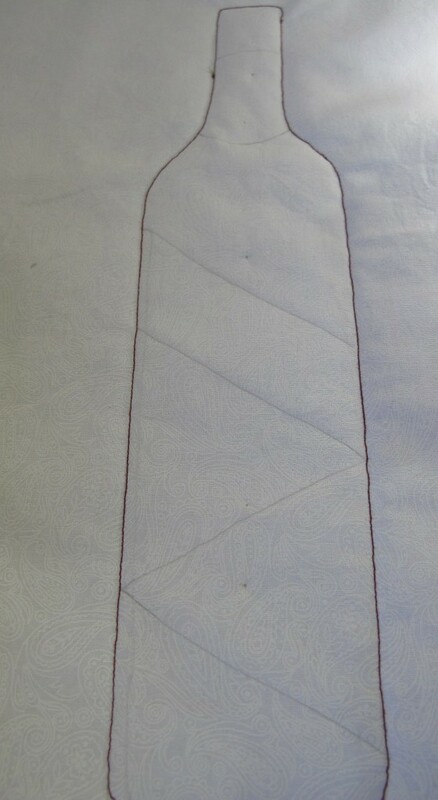 I traced a wine bottle onto some cotton; layered wadding and backing for my quilt ‘sandwich’, and began to stitch. I used Aurifil Cotton Mako 28wt in my machine. I used a size 90 Jeans needle and Aurifil Cotton Mako 40wt in the bobbin. 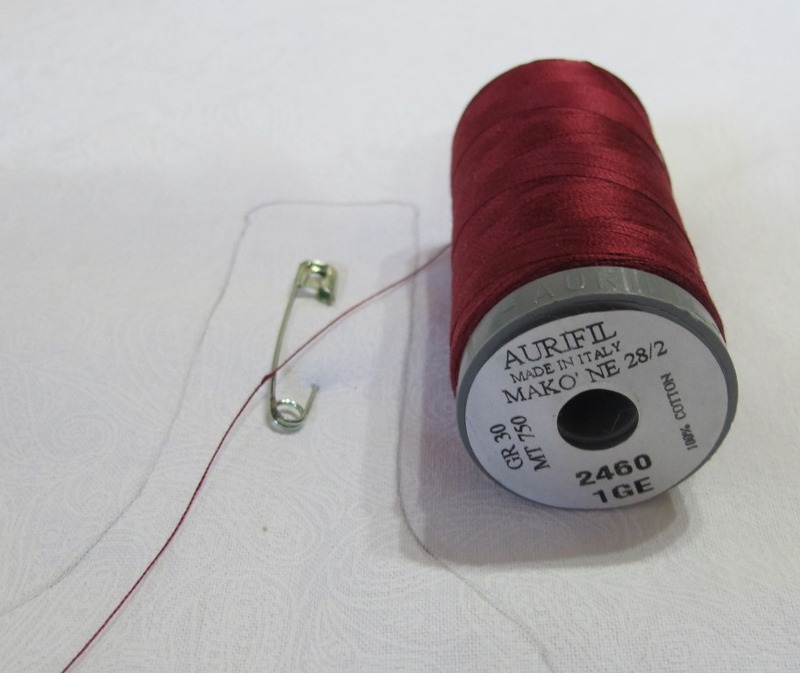 I love this Aurifil shade of red, it is almost the exact colour of wine in a bottle. I divided the bottle into sections. 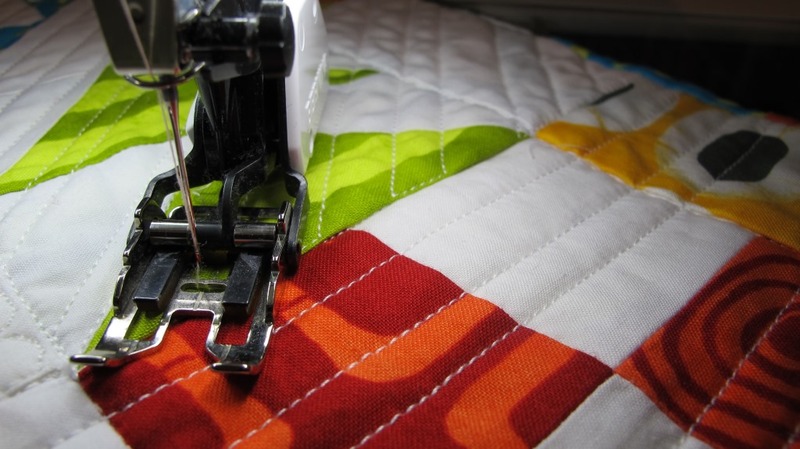 Each section is treated to a different free motion quilt design. 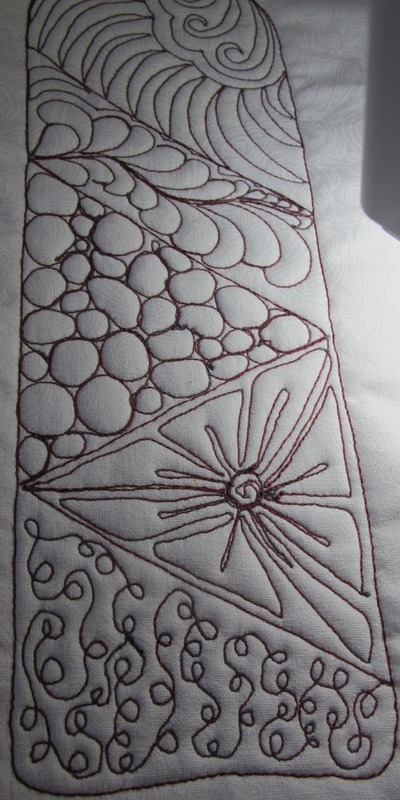 I even revisited Lori Kennedy’s free motion quilting tutorial. I am pleased with the results. AND I can still chat on my mobile phone…hands free (to quilt) of course. 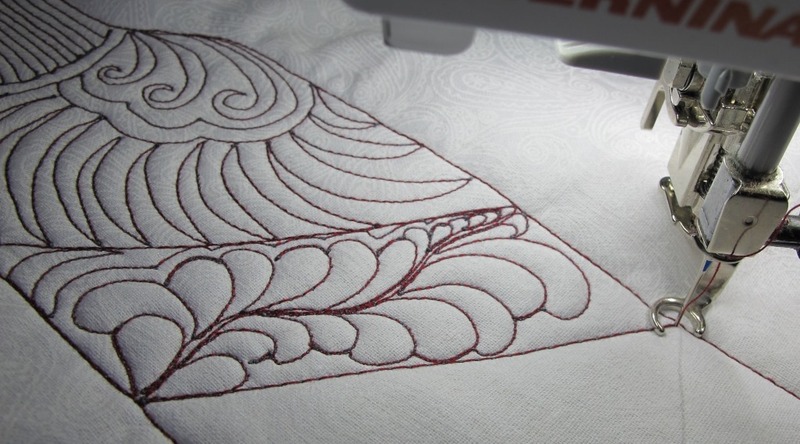 Have a go at Zen-sational Stitching. 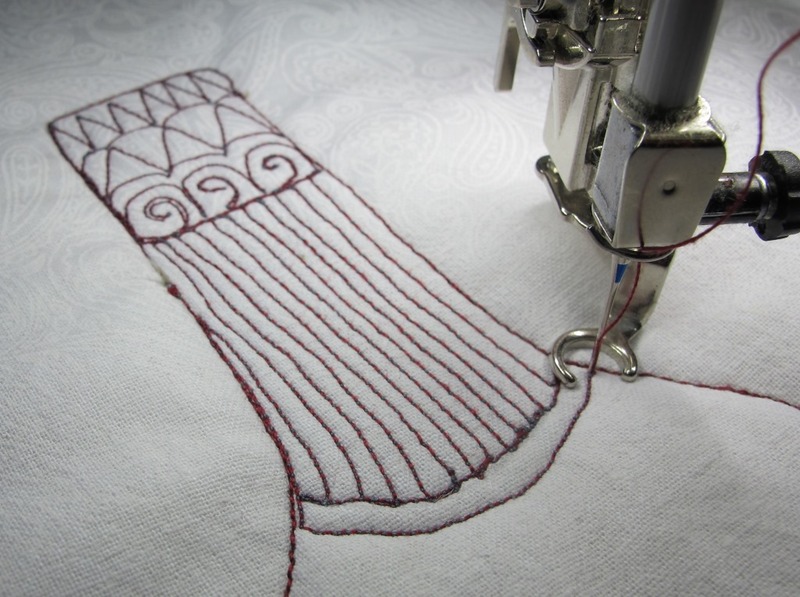 If you can draw it you can stitch it. I love my book, and you can find more of Suzanne’s books here: Suzanne McNeill CZT (Certified Zentangle Teacher). Your quilt top is finished and ready for quilting. All the extra fabric pieces remaining in your charm pack and the pieces left from making your blocks were used to create your backing piece. 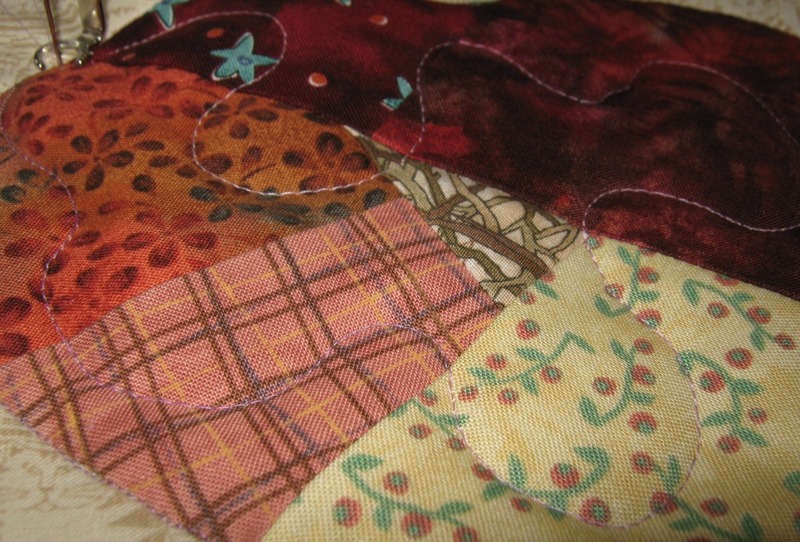 Make sure you allow at least 2 ½ inches of your backing to extend on all sides of the quilt top. I have used a 80%cotton20%polyester wadding in this project. Lay the backing down first, wrong side up; then the wadding; then the top. 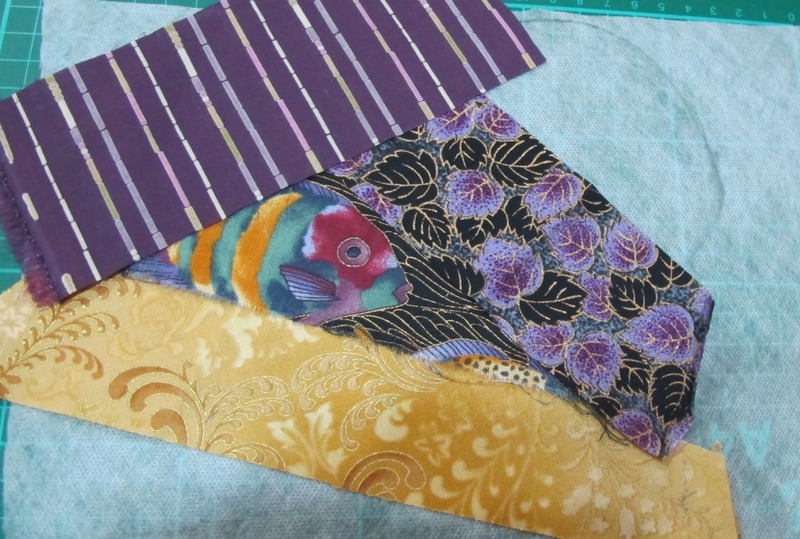 The three layers may be basted with thread or the layers may be pinned together with large safety pins.Once you’ve done that, you are ready to quilt. 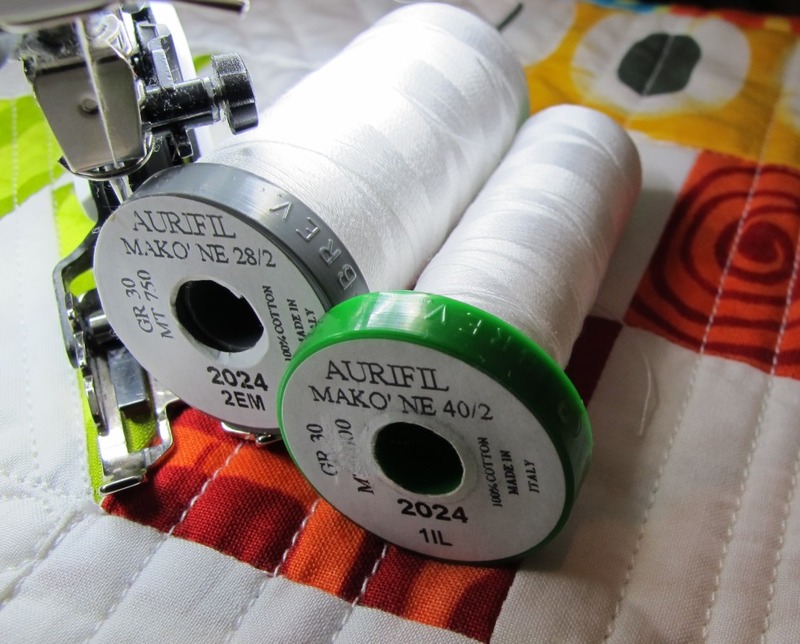 and Aurifil 28wt Cotton Mako thread on the top and Aurifil 40wt Cotton Mako in the bobbin. 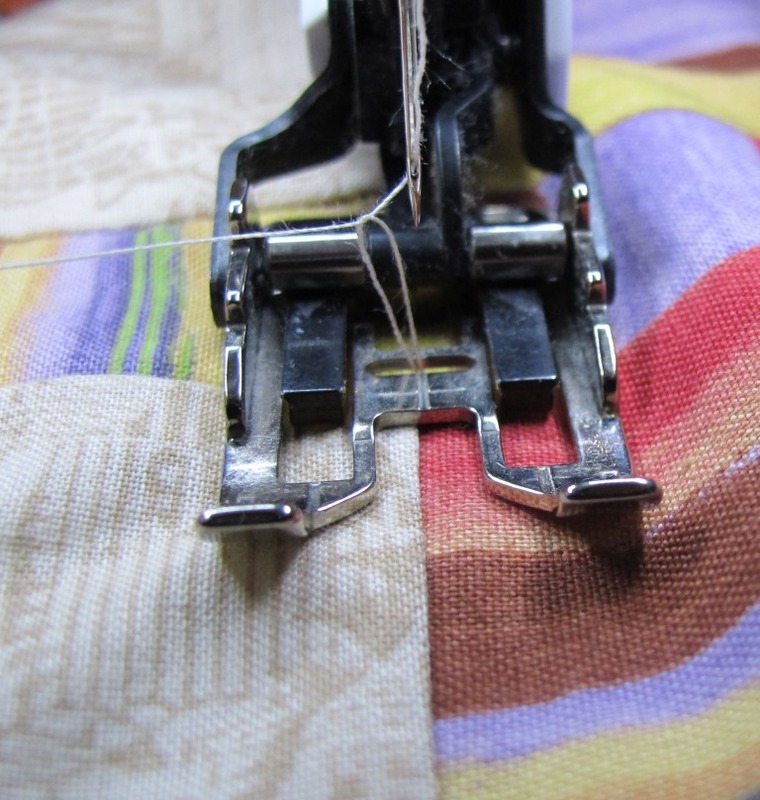 To make a neat start, with the presser foot raised, bring the bobbin thread to the surface of the quilt. Lower the foot and take a few stitches. 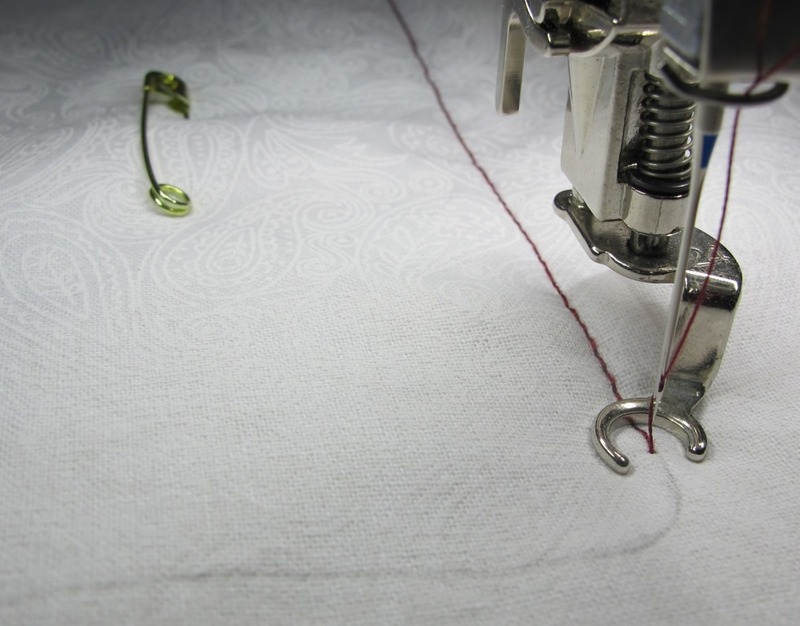 Then backstitch for one or two stitches to secure your threads. 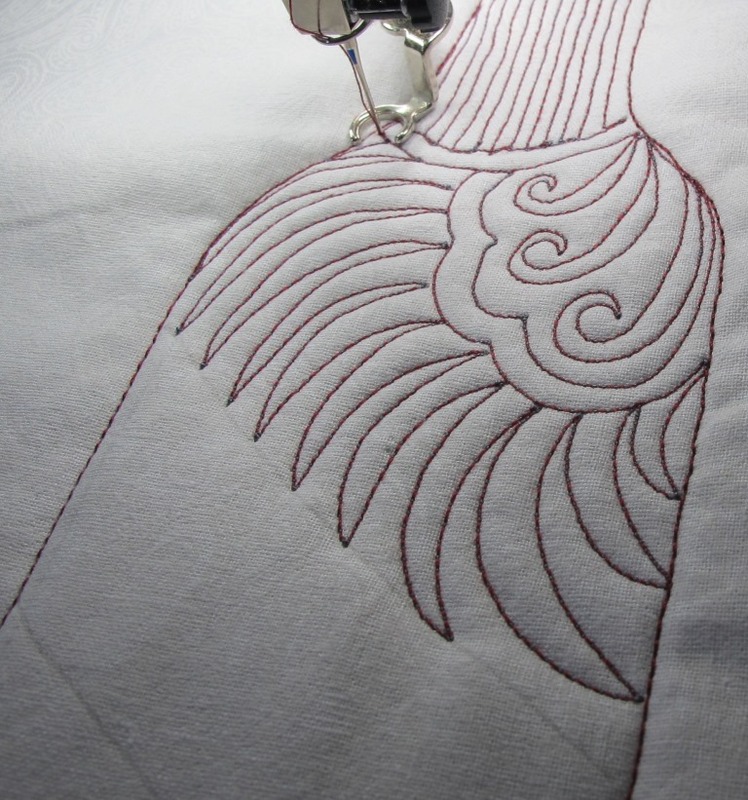 A darning foot was used to free motion quilt the pebbles in the appliqué block background. 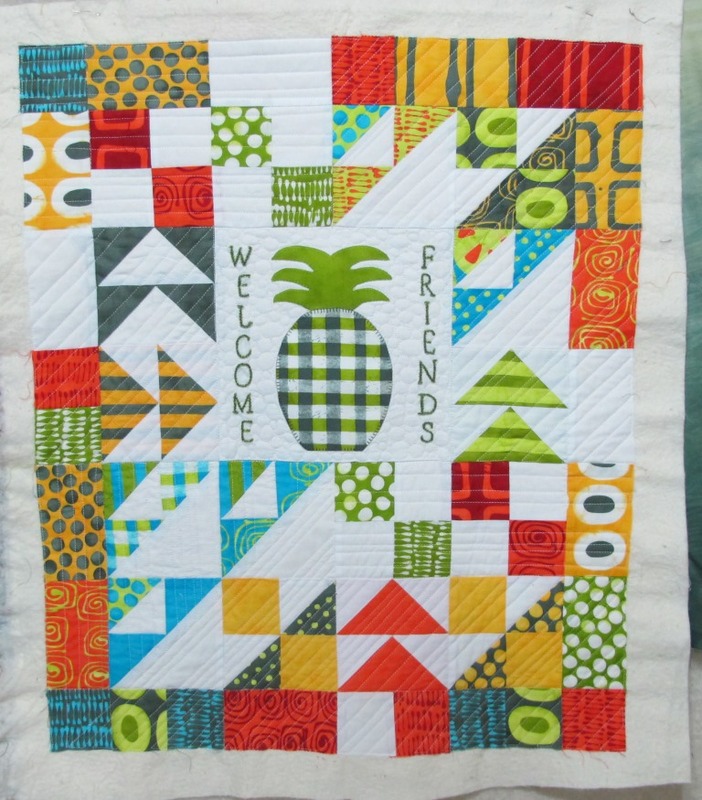 The Modern Welcome Quilt is the perfect size to try free motion quilting and experiment with some of your machine’s built in stitches for a unique quilted effect. 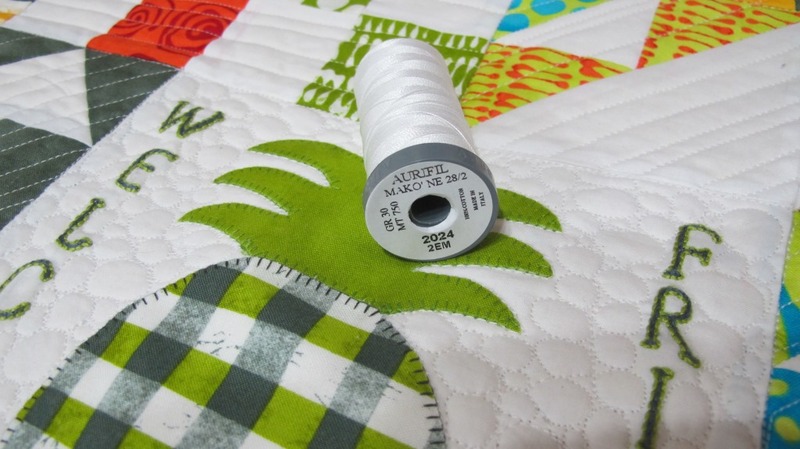 When your quilting is finished, carefully trim the backing even with the quilt top. The excess backing will be used next month to create your binding. 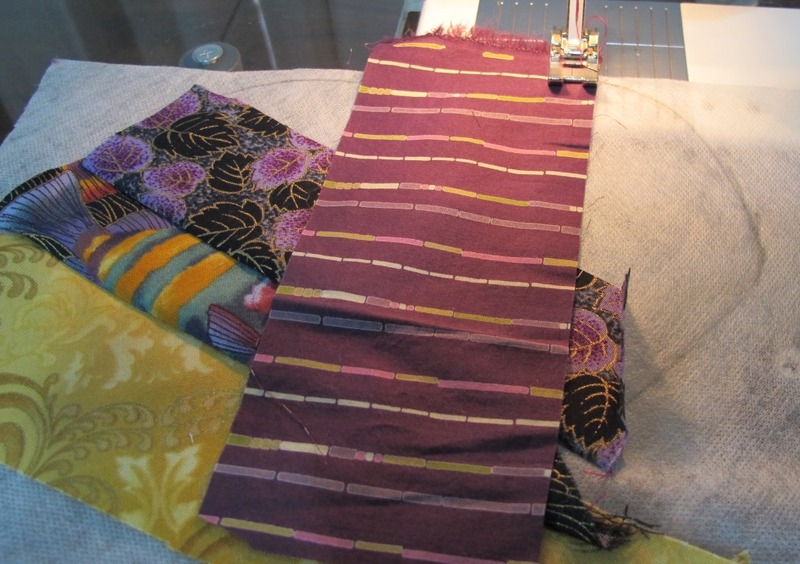 For more information about Machine Quilting for Beginners check out Cheryl Fall for more tips and tricks. Have you ever heard the saying, “My eyes were bigger than my stomach”? When the class booklet arrived last year from AQC with all the possible available classes I wanted to take them all. I had a tough time narrowing down my choices…think box of favourite chocolates. 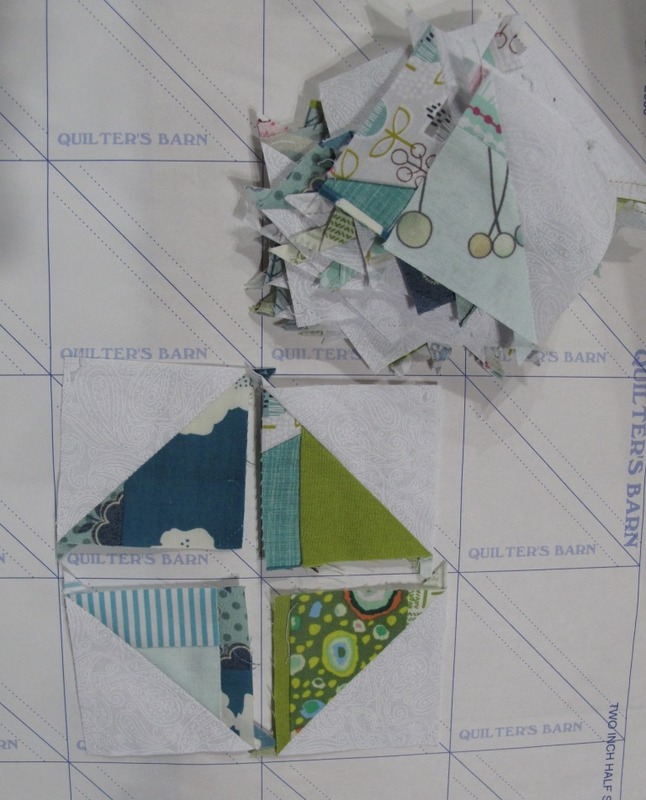 Around the same time, Judy Neimeyer, from Quiltworx, was in town teaching several shop owners her newest quilt design. One of these shops is way too close to my house. You can see how easy it was for me to over indulge. Yes, that’s right. 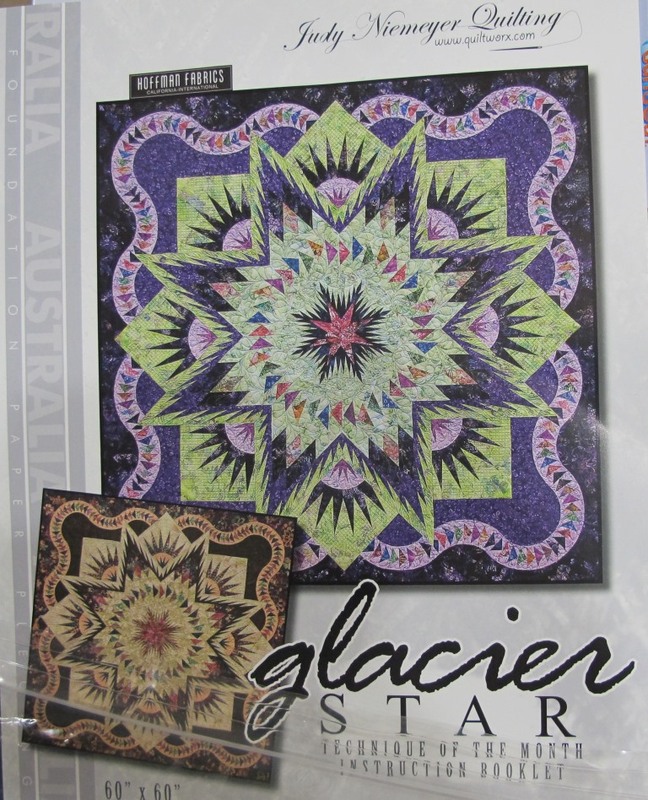 I signed up for two days at the AQC AND the first installment of the Australian Glacial Star quilt to begin the next day. As the dates inched closer I began to question my judgment. I also had a friend visiting from overseas who was attending AQC as well and our time together usually involves fine food, good wine, and chats into the wee hours of the morning. The adrenalin kicked in on the morning of AQC and I boarded the train into town toting all my class supplies; full of excitement. My class with Susan Brubaker Knapp did not disappoint. 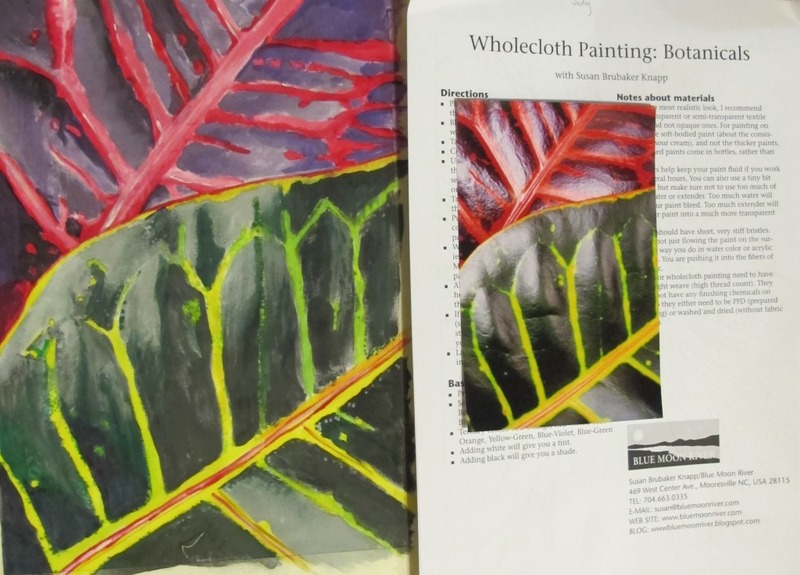 I painted on fabric for the first time in my life and it actually looks like the picture. Susan, an Aurifil sponsored designer, was very generous with her time and ideas and brought many samples of her beautiful work to class. All this inspiration carried me on to a local quilt shop, Palm Beach Quilting, and I began the journey into becoming a paper piecing expert. Maureen patiently taught us new techniques and introduced me to gadgets I had never seen before. The excitement was still driving me on to cut and sew…by the time I started home after 6 hours in class, I knew I had over indulged. I felt weary and a little light headed. I had one too many pieces of chocolate….I had ridden one too many rides at the fair. 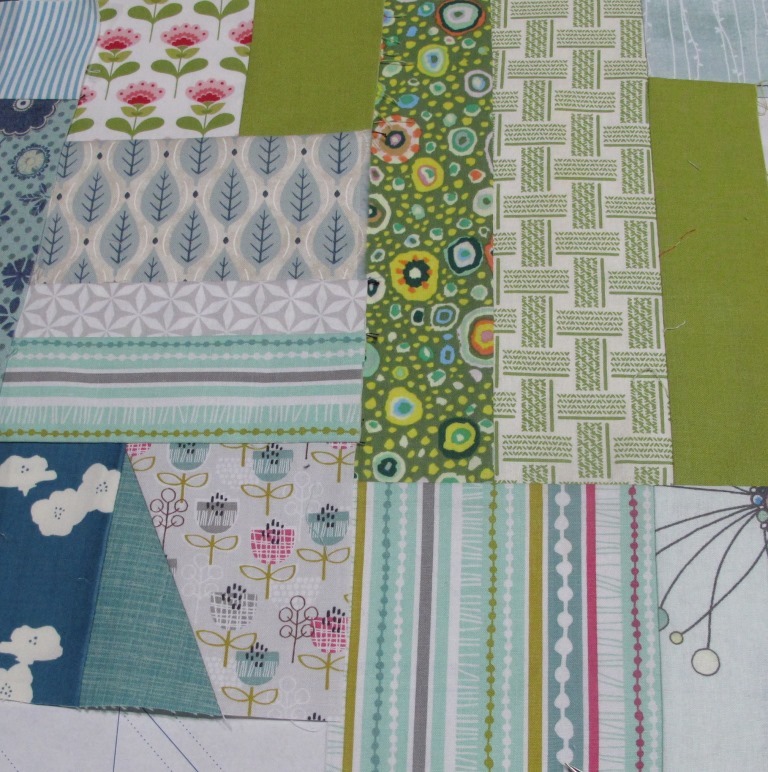 But I still knew after a good nights’ sleep I would be back amongst my new projects and fabrics. I have all year to rest before the next AQC and a full month to complete my homework before a new design is offered from the ‘chocolate box’…..yum…. So jump into the deep end! Over indulge! You can never have too much when you are creating! 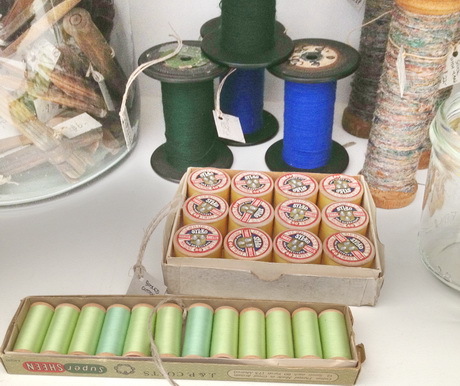 Recently, when I went browsing through an antique shop in Tasmania I came across a treasure trove of old threads. It got me thinking about the sewing tools that were used by women in days gone by and reminded me of the beautiful sewing box that I had been shown by a friend. 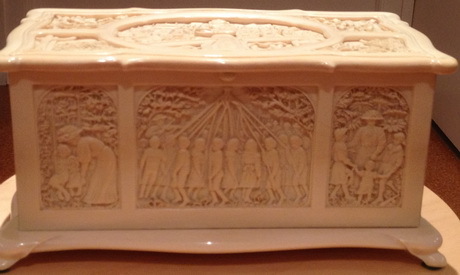 This delightfully, carved, ivory sewing box was given to a family member in the early 1900’s so it is, or is close to, 100 years old. The carvings were personalised so that each side of the box depicts a story of the recipient’s life. 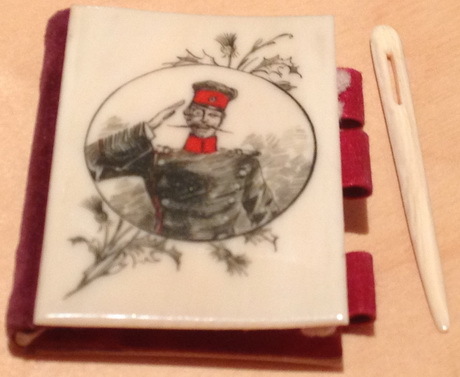 One end of the ivory sewing box. Each image is a “story” about the recipient’s life. and a little container to keep the embroidery thread organised. 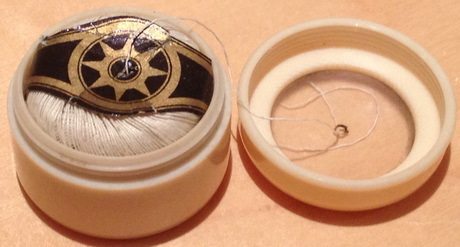 This is a clever container to keep the embroidery thread organised. If, for no other reason, it is worth reading Deborah’s blog to see the beautiful decals that decorate her old treadle. 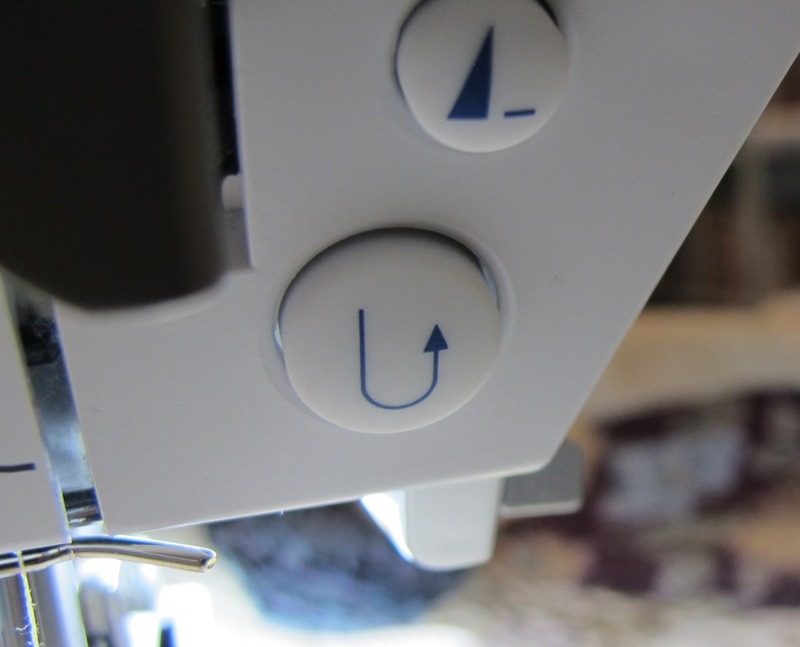 Modern sewing machines do not have such decorative trims, although you can always add a skin to your modern machine to give it a little jazz up. See the links for some ideas, or ask at your favourite sewing machine shop. Today our tools are beautifully practical, but do not necessarily have the same decorative beauty, or personal significance. Unless, of course you make them yourself. 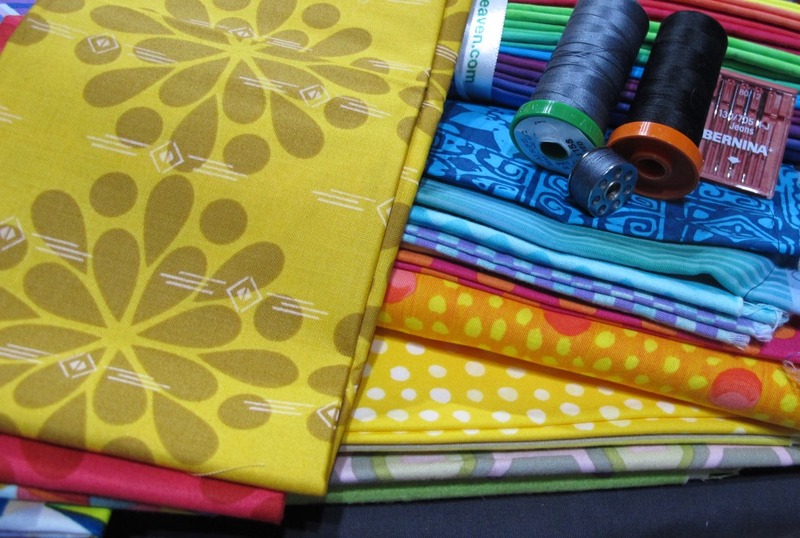 Here are some great ideas from Tipnut to make a sewing machine cover to brighten your sewing room. When ever I sign up for a Block of the Month OR a Design of the Month I become acutely aware of the how quickly time passes. 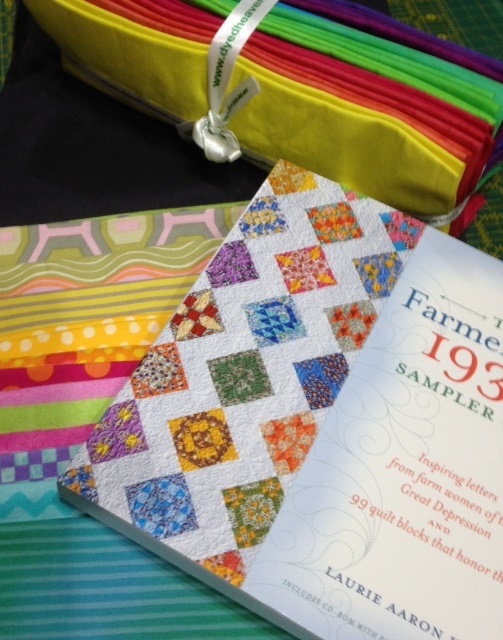 It seems like I have just written about my FMQ accomplishments under the tutelage of Ann Fahl ….THAT was MARCH!! 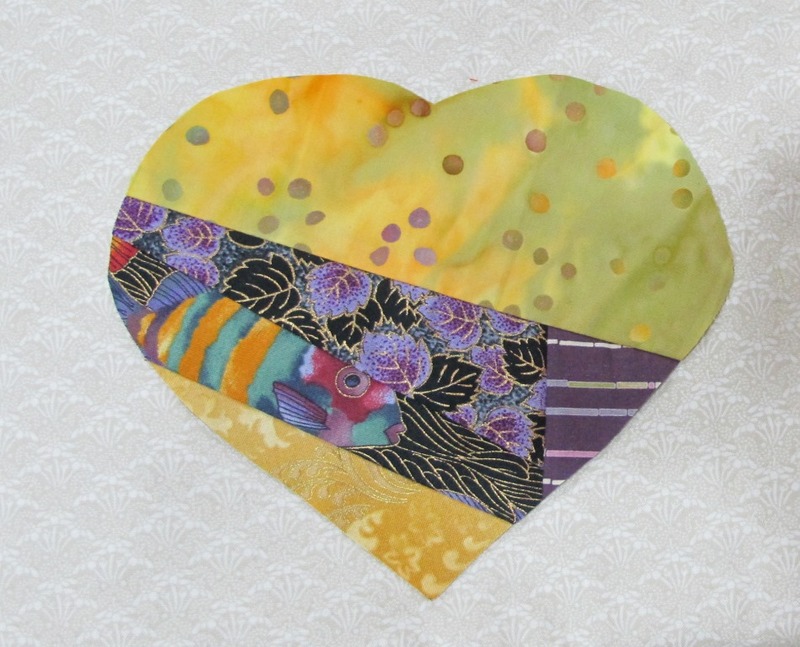 The April FMQ tutor was Don Linn. 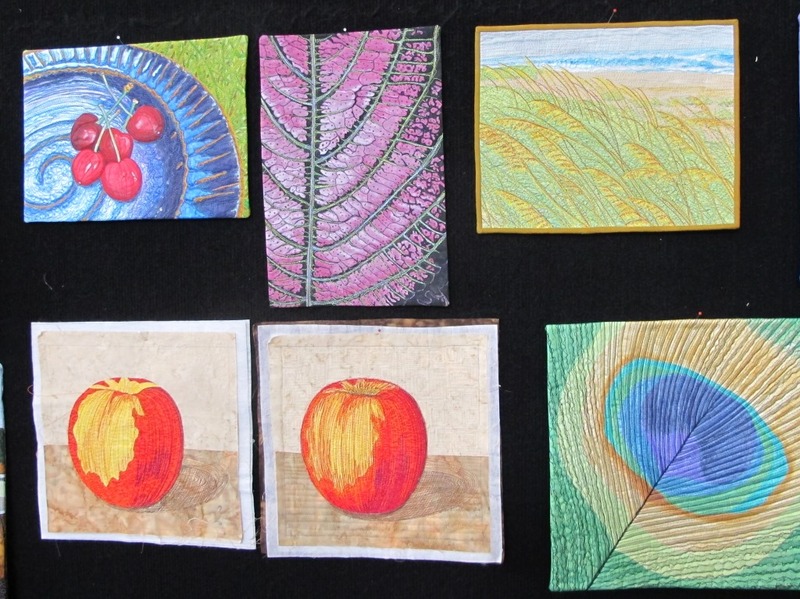 Don has an interesting way of designing and marking quilt patterns onto the fabric. Once you have chosen your design, it is traced onto tulle. The tulle is placed onto your block and the design is transfered with a temporary marking tool. I used a Sewline pencil with green lead for my heart block. 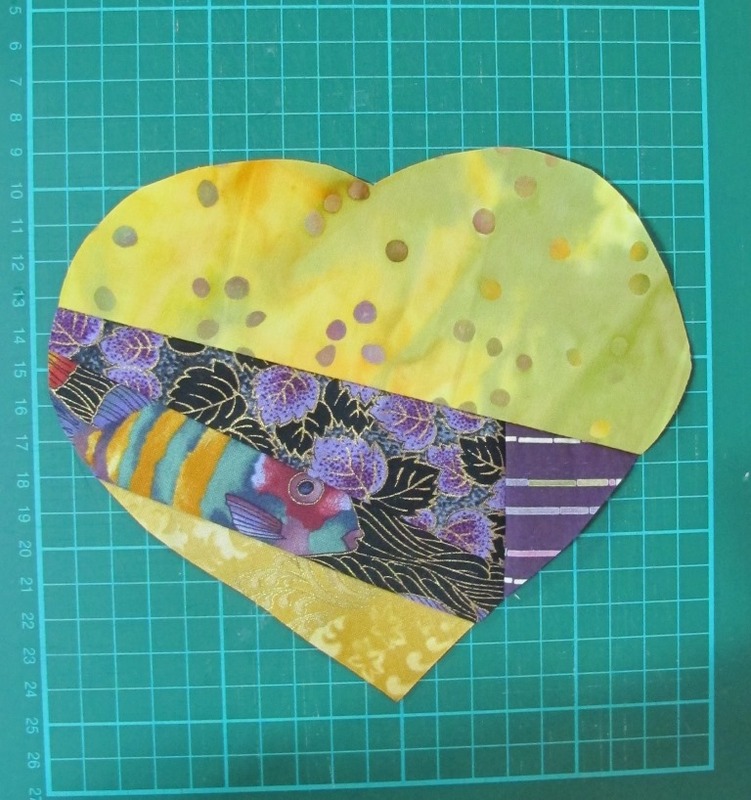 Don’s design wasn’t suitable for my heart block so I used one of Sue Patten‘s designs from her Quilting Possibilities book. Once the design was marked onto my block I had the new experience of staying on the marked line with my needle. I found this a bit awkward and the results are not as balanced as I would have liked. I filled the big gaps with “pebbles”. 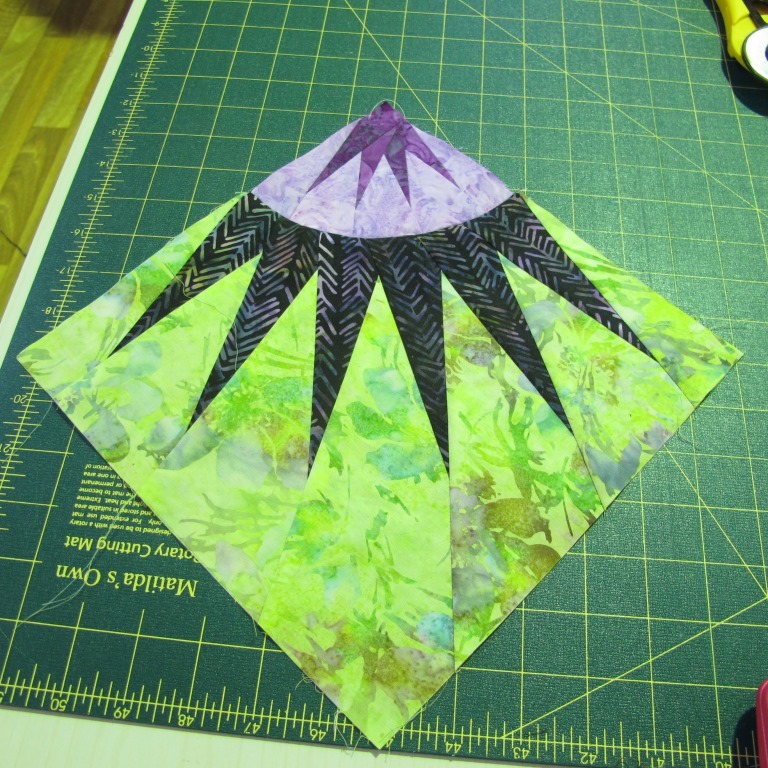 Not wanting to lag behind again on this ‘monthly’ challenge, I completed the May FMQ challenge the day it appeared on Insights From SewCalGal‘s blog! The tutor for May is Leah Day. Leah’s tutorial video is very informative and she presents it in two parts. 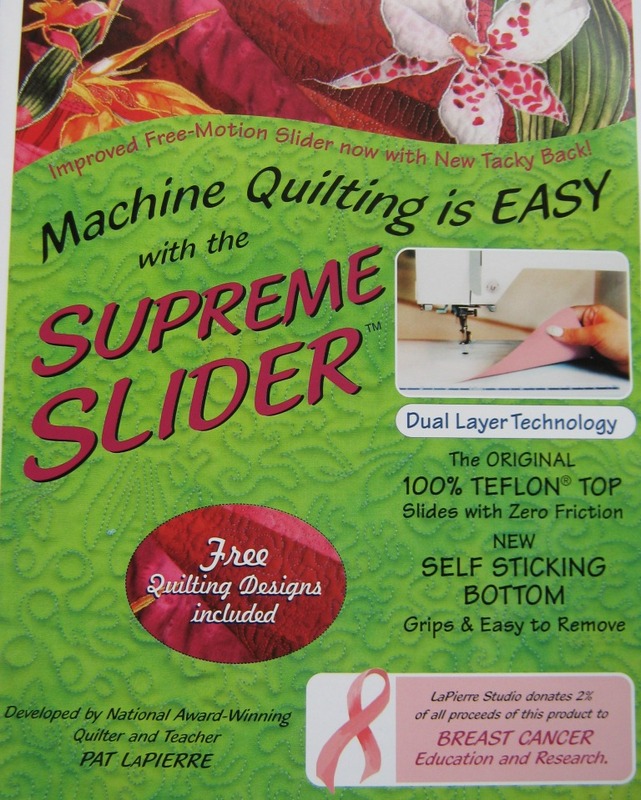 Several tools are recommended by Leah including the Supreme Slider and Quilting Gloves. 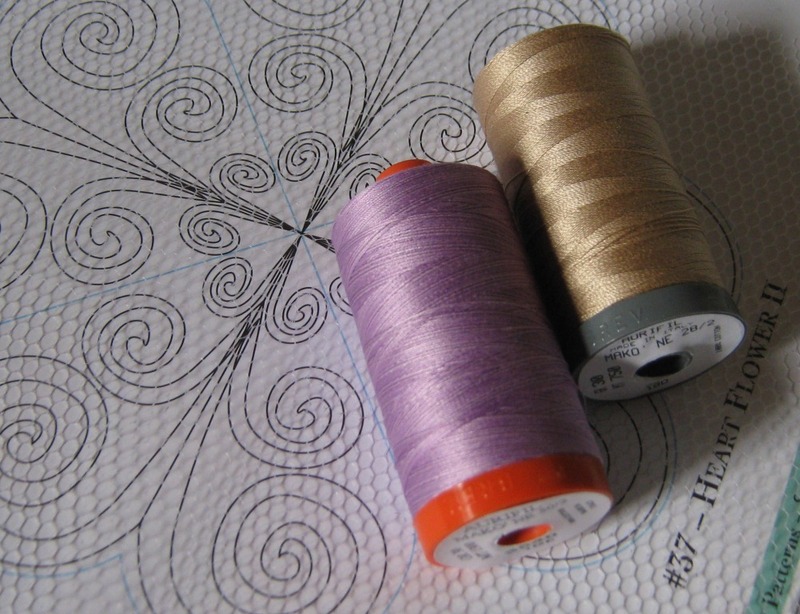 One of Leah’s suggestions is to free motion stitch the straight lines as well as the design lines. 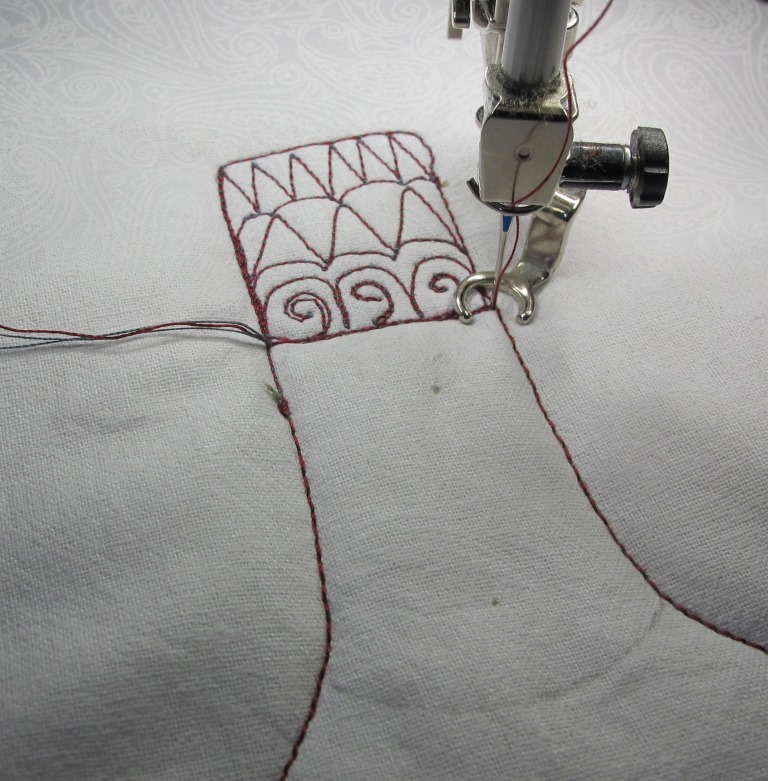 She uses polyester thread in the top of the machine and in the bobbin. I may try this in the future on another project with Aurilux, but I want to keep the thread in this project consistent. Part 2 of the tutorial presented several options. I have used the first option as I think the design suited my crazy patch heart. 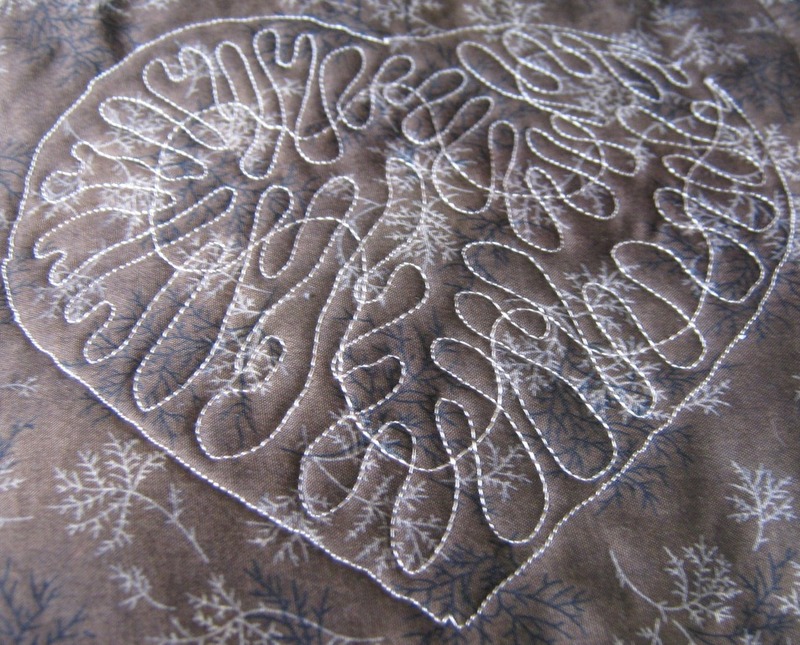 The heart was outlined with free motion quilting and then the large meandering was completed. I can honestly say I felt comfortable doing this so progress is being made. 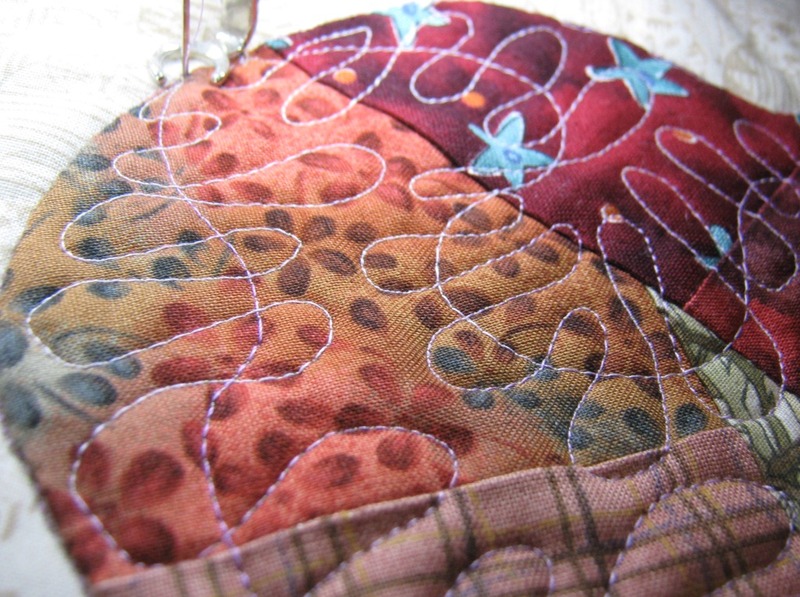 The secondary design is a smaller , winding meandering, filling in the larger foundation stitch. 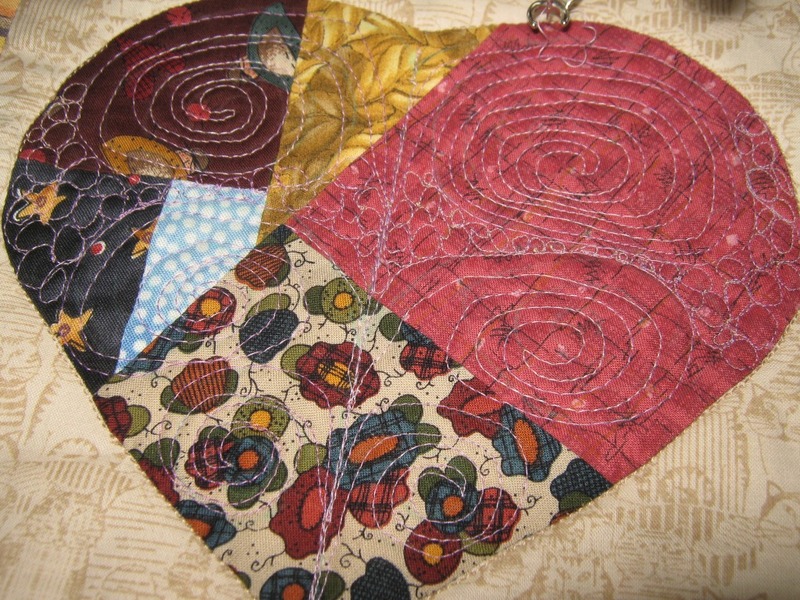 I will humble myself again…the back of the quilt shows my free motion, outline stitching of the heart block. There are a few wobbles and jumps but I am learning heaps. I really like the Supreme Glider and I think I can get used to the gloves. I am certainly feeling braver !